Bonita Jay Peterson of Ironton, Ohio went to be with the Lord December 4th, 2018 at 4:53pm. She was surrounded by family. She was a strong, independent woman and was a fighter until the end. She was born November 14th 1955 in Galesburg, Illinois. She was a long time member of Flatwoods First Baptist Church in Flatwoods, KY and was baptized at Salem Missionary Baptist Church of Grayson, KY. She loved helping with the Grow letters for her church. 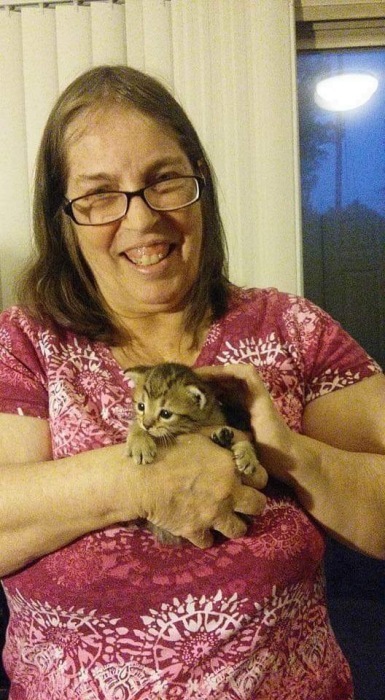 She enjoyed fostering cats and playing card games with friends and family. She is preceded in death by her parents Earl Edwin “Pete” and Alice Joy (Evans) Peterson of Grayson, KY. Her sisters, Linda Kay Peterson of Pipestone, MN and Nancy Gay Marsh of Grayson, KY.
She is survived by her three children, daughter Peggy and Johnny Smith of Flatwoods, KY, her daughter Sheila and Andy Strickland of Raymond, OH and her son Chris and Brittany (Shepherd) Dahlager of Ashland, KY. She has five grandchildren that were her whole world. Ethan Smith, Kyle Smith, and Alexzandrea Smith of Flatwoods, KY and Addison Strickland and Bailee Strickland of Raymond, OH. She is survived by two sisters, Donna and Rick Frazier of Prichard, WV and Rhonda Peterson of Ironton, OH. As well as nieces and nephews; Angela and Josh Truman of Jacksonville Beach, FL; Tom and Crystal Billam of Ashland, KY; Dale Billam of Cherokee, IA and Tonya and Travis Jeremiah of Jacksonville Beach, FL. Also a long time friend Ronald Hicks of Grayson, KY.
Funeral services will be held at Flatwoods First Baptist Church 1206 Bluegrass St. Flatwoods, KY 41139 at 11:00 AM, Saturday, December 8th, 2018 by Pastor Johnny Riley. Interment will follow at Kiser-McGinnis Cemetery on Tygart’s Creek Road in Grayson, KY.
Visitation will be from 9:30 AM till the time of the service at the church. In lieu of flowers, donations can be made to Flatwoods First Baptist Family Assistance fund in remembrance of Bonita Peterson. Funeral arrangements have been entrusted to Wrights Funeral Home, Greenup, KY.